Words are failing me. I don’t think I can fully describe the last week of our lives with the accuracy and depth required for you to fully comprehend how incredible it was. Suffice it to say, sailing from Portobelo, Panama to Cartagena, Colombia via the San Blas Islands on the S/V Luka will be one of our most treasured memories from our year of travels. The most important factor to our enjoyment was the people we were fortunate enough to take this trip with. Our fellow passengers all stayed at the same hostel (Captain Jack’s) in Portobelo, so we got to know each other for a couple days before setting sail. There were 10 of us total: T&I, a lovely couple in their late 20’s from Holland (Janna & Erwin), a tall 25-year old “intelligent investor” Norwegian (Ole), 4 Danish 21/22 year old studs (Morten, Niklaus, Tobias, & Troels), and a 28-year old flying-over-fire (see pics) German named Juergen. Janna and Erwin are also traveling for a year and started in January in Mexico. She was able to take a sabbatical from her job (oh to work in Europe), and Erwin, who is an engineer and officer for HollandAmerica cruise line, quit and will find a new gig upon his return. Juergen finished his formal schooling in mechatronic engineering and will be starting an awesome job for Bosch, essentially test driving race cars (be jealous). Ole is a power engineer, and I think continuing his studies in that in hopes of moving and working in the US someday soon. Morten, Niklaus, Tobias, and Troels are young and figuring it all out, but in the meantime, are traveling the world and having a blast. Of course, as intelligent and worldly Europeans, they all speak perfect English, and a few speak perfect Spanish. Without any language barrier, we were all able to chat and joke with each other, and as open-minded, easy-going travelers, everyone got along. Close quarters, queasy stomachs, tiny shared bathroom, and no shower smelly-ness only added to the sense of closeness and affection we have toward each other. It’s really the people that have made this trip memorable, and suffice it to say, my faith in humanity has been restored tenfold. Our crew was a Polish couple – Tom and Bea (and their 2 jack russel terriers). 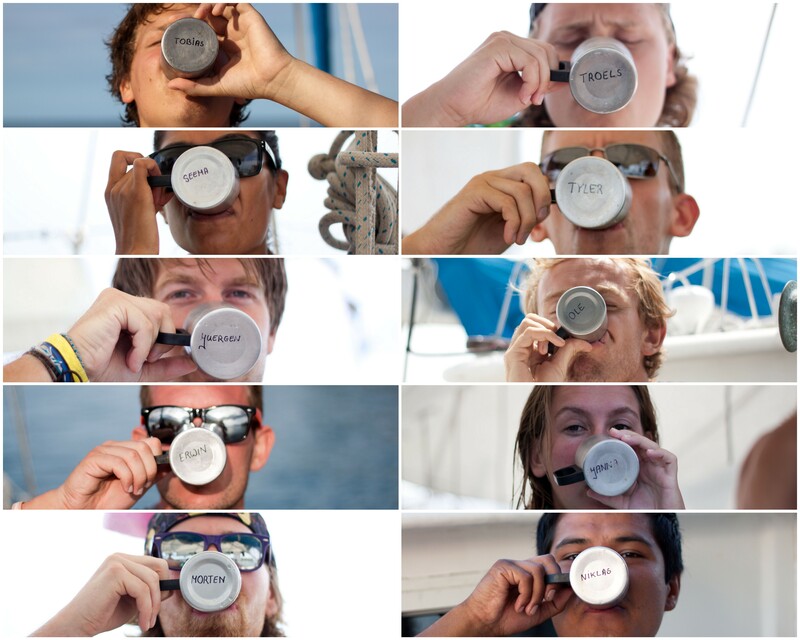 Tom is in the Guinness Book of World Records for sailing around the world non-stop, by himself the “wrong way” (i.e. against prevailing winds) for 13 months. We were in excellent hands. Bea is an awesome cook, and we ate the best we have since leaving home. The boat is probably a good 15 years old but is in great condition. I wish the winds were better so we could have sailed more and motored less, but overall our first real boating experience was awesome. 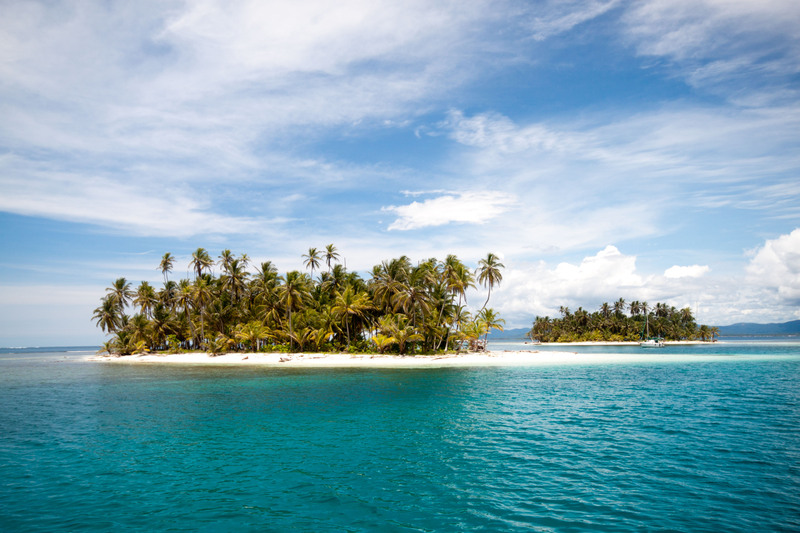 The San Blas Islands are a group of 365 islands off the coast of Panama that are autonomously ruled by the Kuna indigenous tribe. The tribe has very strict rules about tourism (like no scuba diving allowed), how many people are allowed on the islands, number of boats anchored, etc. I think there are a couple that have electricity, plumbing etc., but the vast majority have no inhabitants and no signs of civilization. We were fortunate enough to spend a night on one such island- slept in hammocks, bonfire all night, Kuna-made (pretty un-tasty) dinner of rice, fish, and plantain soup. The sunset was picture-perfect, but the sunrise took my breath away. The vivid oranges and pinks on the horizon were unlike any I have ever seen, and it was made all the better because I was lying in a hammock taking it in. Peaceful insignificance. To be fair, the snorkeling wasn’t as good as in Belize, and I’m fairly convinced we may never match such underwater delights anywhere else. But it was still lovely – the coral was colorful and varied, there were many types and sizes of fish, tons of starfish, sharks, barracudas, stingrays, and lobsters. The water was utterly clear and the perfect shade of turquoise blue and the temperature was refreshing without being cold. We’ve now been in Cartagena for 2 full days, and I’m so glad we decided to switch out Ecuador for Colombia. This country is so vibrant and beautiful and alive. Cartagena is a romantic, charming city and is definitely the most beautiful example of a colonial city I have ever seen. We partied a bit on Wednesday night with our shipmates, and I’d say the only negative we’ve seen of this city is quite a few seedy characters – a plethora of coke dealers and prostitutes. Tomorrow is our last day in Cartagena – we will take the night bus to Medellin and get there on Sunday morning. Since our ship was delayed, we only have until the 2nd to spend in Colombia- unfortunate, but just an excuse to come back again in the future! Glad you two are still flourishing on your trip. Happy Memorial Day. Thanks for keeping everyone posted. This woman Michelle Milne Jones Miller, was hired on the boat as cook, she could not work because of drugs and alcohol problems, she was kicked out, now, in revenge she is posting BS everywhere possible. Guys, please keep her away. Hey Bea – i took care of it. its off the blog. She seemed crazy to me.